While Oktoberfest in Germany is already finished, the Oktoberfest beer season here in the U.S. is just getting underway. 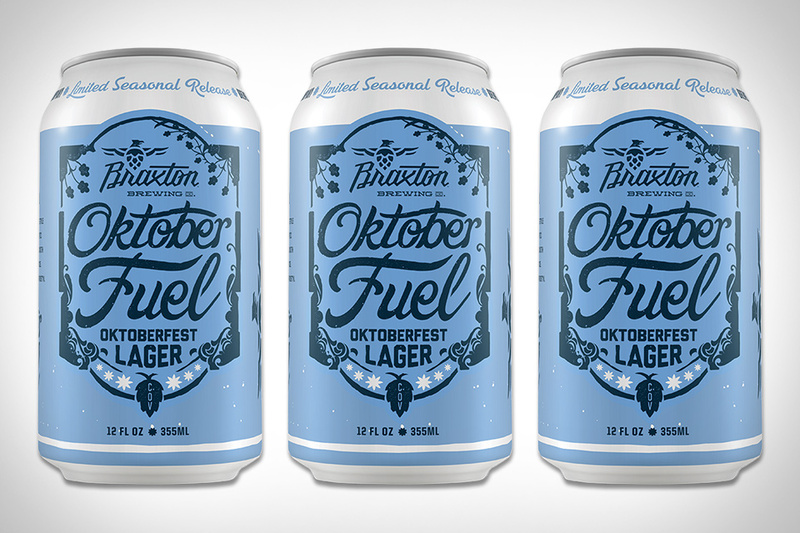 Braxton Brewing in Covington, KY just released their first dip into the Oktoberfest pool with Oktober Fuel Lager. It's brewed using top shelf German malts, decoction mashing, and noble hops. The result is an Oktoberfest that is balanced by malt sweetness and a crisp finish. And thanks to these clean, bright, well designed cans, it's bound to stand out amongst the dull packaging at your local bottle shop. Patagonia Provisions and Hopworks Urban Brewery are both huge proponents of sustainability, and they've put their money where their mouths are in the form of Patagonia Provisions Long Root Ale. Long Root Ale is crafted using organic two-row barley, organic yeast, organic Chinook, Mosaic, and Crystal hops, and Kernza. And the distinct flavor of this beer comes from Kernza, a perennial grain developed by the The Land Institute. Kernza has long roots and thrives without tilling. It also doesn't require the same amount of water or fertilizer most grains need to survive. Long Root Ale is a big step forwards in the grain to glass movement and is worthy of a spot in your cooler. When it comes to American sour ales, Upland Brewing in Bloomington is at the head of the class. Upland Brewing Darken Sour Ale is a standout amongst their line of sours and is a take on a Flanders Brown Ale. Spices were added to the brew to provide a more complex flavor and it was then aged in oak barrels. Packaged in these 500ml bottles, it's tart, but approachable with a dry, spicy finish. The calendar might say that summer is over, but the temperatures in many parts of the country still disagrees. So as summer winds down, pretend it's mid-July with Taft's Ale House Culebra Cut. Culebra Cut is a American brown ale brewed with toasted coconut and provides a taste that brings a taste of the islands with each and every sip. Packaged in these great cans complete with William Howard Taft — the 27th President of the United States — on each one. It's worthy of your time, regardless of the season. While the market moves towards fruit-forward IPAs, the fine brewers at Wicked Weed in Asheville, North Carolina and Creature Comforts in Athens, Georgia want to remind you that the hops themselves are all you really need. The collaborative effort is called Juiceless IPA, and while it gives off a tropical, fruity aroma and taste, there was no fruit harmed in the making of this beer. The biggest, most aromatic hops are used to create this IPA, and it all comes packaged in 16.9 oz bottles. In an effort to squeeze the last drops out of summer, Upslope Brewing is bringing back their popular Blood Orange Saison for the second year in a row. The original concept for the beer was born out of a collaboration with Hops & Pie in Denver, and it was so well received as a limited release in 2015 that Upslope decided to brew it again. Citrus forward but balanced by the addition of pink peppercorns, it's a hoppy saison that is a great choice to wind down summer with. Summer might be winding down, but for people that love hoppy beer, a fresh, cold, IPA is a year-round obsession. Add Wise Blood IPA from Wild Heaven in Georgia to your list of late-summer sippers. It's a tropical fruit forward IPA with a clean finish that is one of several tasty, hoppy brews to come out of Georgia in the past couple of years. It measures 6.2% ABV and comes in 12oz cans with a great neon lettered design.